February 4, 2019 — “We picked a weird place for lunch. Hope you don’t mind.” That was from the clients we were meeting. I glanced at my colleague and wondered if I was endangering the mission. We were in Nottingham, England, the city made famous by Robin Hood. I was in town for my day job, and my colleague and I were about to get some rare face time with these overseas clients. That means I wasn’t oddity hunting. I was on duty. Engaged in the grind that keeps my family housed and fed. And when they said “weird place,” I didn’t think it would be an OTIS oddity, even with their British accents giving the phrase an additional level of intrigue. 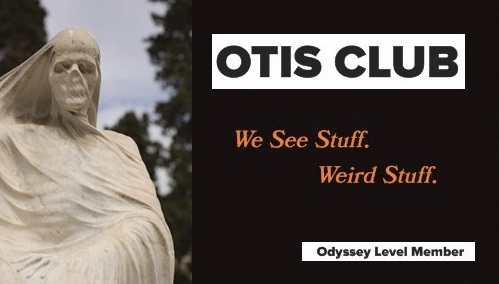 My definition of “weird place” has warped inside-out over the decade of doing this OTIS thing. Still, the operative word in that whole suggestion was “lunch,” so we were game, wherever it was. They then took us to a restaurant in a cave filled with cursed furniture that claims to be the oldest inn in England. Whoa. It was like they had Googled my life before I arrived. According to the big numerals painted on its exterior, the Ye Olde Trip to Jerusalem was founded in 1189. It got its name because it was supposed to be a way point for knights en route to the Crusades. Wikipedia is plenty doubtful of those claims, however, and makes a strong case for it being merely really, really old. Because everything in England is really, really old. There seems to be a case for a brewhouse of some sort occupying that spot way back then, though, especially since them caves are great for brewing and storing beer. Yeah. Cave beer. The Ye Olde Trip to Jerusalem was absolutely charming from the outside, with a bright white, asymmetrical exterior, dark roofs and windows, multiple chimneys…and its placement at the bottom of a cliff. The cliff was one of the sides of Castle Rock, so named because atop it sprouts Nottingham Castle, the scene of the final confrontation between the Sheriff of Nottingham and Robin the Hooded Man. And while the past claims of the inn were dubitable, we discovered quickly once inside that it was definitely built inside a cave. A series of small caves, actually. After we made it through the building bits, we ended up in the caves part, with each one set up as a dining or lounge area. Walls and ceilings of stone pressed in on us from all sides, alleviated from being claustrophobic by the pale color of the limestone and the lights rigged up throughout. The whole area of Nottingham is riddled with caves. The Robin Hood story could easily been a Morlockian one instead of a sylvan one. After we were seated at a table, I immediately excused myself on the pretense of hitting the loo. Instead, I wandered through the whole place, marveling at where I had inadvertently found myself. I mean, this was no mere theme. No Rainforest Café. We were burrowed deep inside Castle Rock. Apparently, the cellars are the most impressive part of the inn, and they offer tours. Although they weren’t offering them while we were there. I asked. And that’s what I meant earlier by endangering the mission. There was definitely a danger of me turning OTIS when I should be prioritizing real life and bolstering working relationships. I’ve never thought of OTIS as the werewolf or Mr. Hyde part of my life but writing that last sentence just made me do that. Hm. However, something did pull me back to the dining table and the work lunch. Two things, actually. A magic chair and a cursed ship model. Right beside where I was sitting was a small fireplace with a slightly raised platform. On that platform was an ornate wooden chair…ye olde Pregnancy Chair. According to a placard above it, any woman who sits in that chair becomes pregnant. And, of course, I got my picture taken sitting in it. One of my clients took the photo. Endangering the mission again. I mean, I played it off as being good-natured and willing to do anything to break the ice of a bunch of professionals and semi-strangers around a table, but really I was thrilling inside at the oddity of it all. It would only be five seconds ago that I would see in a close-up photo a smaller line of text in the placard asking visitors not to sit in the chair because it’s fragile. Also, that my zipper has half down. But, as the prophet said, wait--there’s more. A placard by the galleon exclaimed, “Clean It At Your Peril!” before explaining that the model ship was supposedly giving to the inn by a visiting sailor at some point in the misty past. Since then, three different people had cleaned it and every one of them had died mysteriously shortly thereafter. That’s why it was high on a shelf, behind glass, and in full defiance of whatever the British version of the Health Department is. So we ate our meal in that cave beside that Pregnancy Chair, across the room from that Cursed Galleon, clambered out into the light of day to see the Robin Hood statue, and said goodbye to our clients. It was kind of a sad parting for me. There was just no way that I could express to them my full gratitude for what they had shown me without sitting them down at the base of that statue and monologuing about OTIS for an hour.